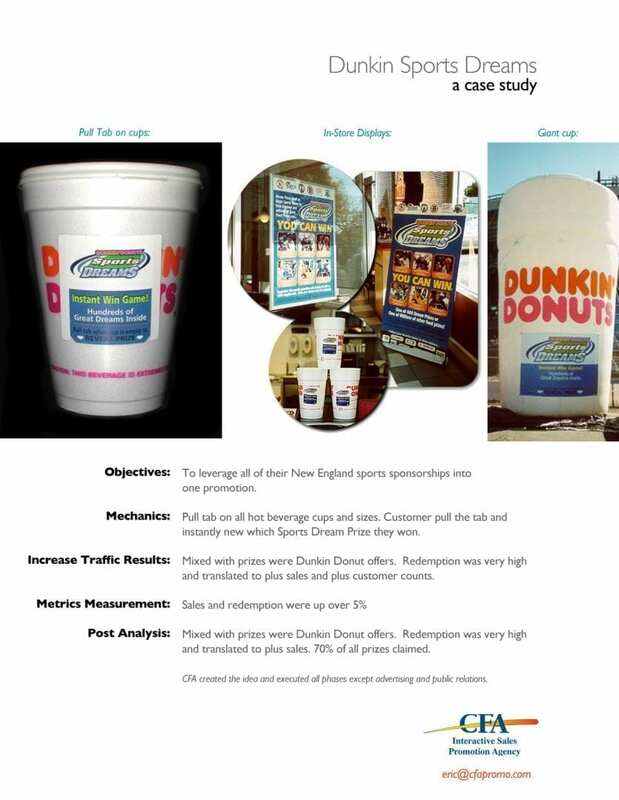 In December of 2002 Dunkin Donuts partnered with all six of New England’s sports team to launch a marketing blitz. It began on January 3rd of that year and gave away over 30 million dollars in prizes. Over 1,500 stores participated in the promotion that not only brought publicity to Dunkin Donuts, but also enticed fans of the sports teams as well. The Dunkin Donuts Sports Dreams peel-and-win promotion ran from January 3rd to February 14th of 2003. The stores printed stickers on over 31 million coffee cups at 1,500 participating franchises throughout Southern New England. To put that in perspective how big the blitz was, the franchise has over 3,500 locations in the United States. A third of them participated in the marketing blitz. That’s a significant portion of the company and millions of consumers reached through the peel-and-win promotion. The prizes given away by the coffee and baked goods franchise, as well as the participating sports teams, has an estimated retail value of 30 million dollars. Most of the prizes consisted of sports team packages, food offers, and autographed memorabilia. There were opportunities for winners to meet players from the Boston Red Sox, New England Patriots, and Boston Bruins. Winners were also able to attend a clinic hosted by a member of the Boston Celtics, watch a portion of a Red Sox game from within Fenway Park’s “Green Monster,” and ride a Zamboni ice-cleaning machine at a Bruins game. All were experiences of a lifetime. All six of New England’s professional sports teams partnered with Dunkin Donuts to promote the marketing blitz. Thanks to them, they gave millions of people the opportunity to win a variety of prizes. Dunkin Donuts and the partnering sports teams provided consumers and fans with prizes and experiences of a lifetime. The 2002 marketing blitz was as successful for the franchises as it was exhilarating for millions of customers. They promoted their products and services in fun, exciting ways that tasted good too. If you’re looking to expand your company, give CFA a call. We’re a sweepstakes management company that has been in business for over 20 years. We are nothing short of experts at what we do, and we’d like to help you prosper your business.